Part of a series on newsroom transformation to serve digital news consumers, originally published by Knight Digital Media Center @ USC Annenberg. Jay Rosen, NYU journalism professor and news media analyst, blogs this week about an emerging skill set that will make journalists highly marketable to employers. Rosen says people who are looking to hire journalists often cite some version of this: “I need people who can look at the news and information situation they are handed, look at what we know about our users and how they behave, look at what we say and believe about our brand, look at all the digital tools we have now… and just make good decisions” instead of reverting to familiar forms. Platforms and story forms. The journalist must know tools and forms are available and what works best in what situation. This requires breaking away from a print-first 15’’ story mindset. Training helped the journalists raise their digital literacy before they became immersed in learning and apllying new digital skills. Company strategy. The journalist has to understand the company’s strategy (and the company has to have one) for capturing digital audience engagement. The Four Platform initiative emphasized data, real-time news, watchdog and grassroots journalism. KDMC added the concept of franchise topics – ones in which digital news consumers were highly interested and dissatisfied with what was already available. A fourth important skill is the ability to analyze and act on digital metrics. While these metrics are no substitute for direct research with news consumers, they are vital to strategic efforts to put resources where they have the most impact. For the new Journal Media Group, raising metrics expertise is a challenge for the coming year. This takes nothing away from the importance of multimedia skills. But training in skills alone may not produce results that are worth the effort. In his post, Rosen asks what the new skill set should be called. We have called it “digital literacy,” for lack of a better term. I am not sure that really captures the sweep and depth of what is now required to be a successful journalist on digital platforms. Whatever we call the skill set, it ought to be a central focus for journalism organizations and educators as well as journalists who want to stay in the business.. Figuring out what to stop doing in order to serve new priorities was a significant challenge as newsrooms move to “digital leads” footing, where they produce content and engagement on phones, tablets and the web and then repurpose digital content for the newspaper at the end of the day. The pull of tradition – those routine stories, that focus on the next day’s print newspaper, the idea of being all things to all people – can undermine the transition from print focus to digital. One strong trait of the culture in many newsrooms is “perfectionistic” – the fear of making a mistake. This serves journalism well. But organizationally, it can translate into fear of missing anything or of leaving anything out. That’s highly non-strategic. Determining those priorities, however, was just the start. “The biggest hiccup was getting staff to identify what work they could stop doing and in getting them to agree to stop doing work of low priority. They were willing to take on the new tasks but also wanted to keep doing old tasks that no longer made sense to do,” Mark Tomasik, editor at Treasure Coast Newspapers and www.tcpalm.com, said. The newsroom in Treasure Coast developed a practice of measuring time-consuming work against three priorities: franchise topics, breaking news and investigative reporting. “Resource-intensive efforts that do not fit at least one of those categories are not a priority,” Tomasik said. Building on Treasure Coast’s approach, KDMC recommended that each editor work with staff and the publisher to develop a short list of priority “filters” to use to test which stories were worth a high level of resources. The idea was to separate high-priority coverage from lower priority items. That way, the lower priority items would be competing against each other but not sapping resources needed for higher priority items. Developing the list through discussion with the staff was designed to increase understanding and the likelihood that the filters would be used. Having publisher buy-in would be essential if the filters were going to be meaningful. While Treasure Coast used its filters to hone daily priorities, Lyons, the editor in Redding, said his leadership team has since used the filters at quarterly strategic planning meetings. Can other newsrooms adopt this approach? I think so – with careful discussion at the outset of what the priorities are, why they matter to digital news consumers, and how they will be used by everyone in consistent fashion. This post is adapted from Digital Leads: 10 keys to newsroom transformation. Fourth in a series on newsroom transformation to serve digital news consumers, originally published by Knight Digital Media Center @ USC Annenberg. In a ‘‘digital leads’’ newsroom, print moves way back to the end of the line. Journalists first create content and engage on digital platforms – phones, web, tablets. Then, the digital content that is most likely to interest print readers is repurposed for the next day’s newspaper. Sounds simple, right? For many newsrooms, getting there is anything but easy. Even journalists who scoff at the idea of “doing more with less,” are sometimes reluctant to give up familiar tasks. An important aspect of the initiative was that it did not dictate outcomes such as newsroom structure and job descriptions. Instead, it asked the newsrooms to follow a process that helped them shape priorities, plans and practices around the needs of digital news consumers. Structures and roles flowed from their plans. Implementation of protocols for breaking news and social media. Newsrooms implemented protocols that included Tweets, alerts, and visuals on breaking stories. The Redding (CA) Record Searchlight began social media interaction with readers during reporting on non-breaking stories. In Washington, the Kitsap (WA) Sun staff began scripting social media campaigns in advance for projects so those elements would not be forgotten. Reductions in resources devoted to traditional coverage and print production. Treasure Coast (FL) Newspapers, for example, cut the number of pages remade for different print editions and used more wire content. Knoxville developed a system of pre-designing many pages to reduce the workload, an innovation rolled out to several other newsrooms and the company’s Central Desk. The Knoxville (TN) News Sentinel dropped certain features a couple of days a week and developed content-sharing agreements with other news organizations in Tennessee. The newsrooms found that vigorous production of digital content more than filled the next day’s print newspaper. In addition to reductions in print production, editors found a variety of ways to shift staff resources, typically dropping routine stories or assigning them to freelancers. Converting the traditional afternoon print meeting to a planning session for digital content and engagement for the next day. In Knoxville, for example, planning for digital platforms for the next day became the focus of the main afternoon news meeting while print planning was downplayed in a smaller, separate stand up. Knoxville displays the budget on a large white board in the newsroom that is day-parted to emphasize the need to post at peak times. Re-creating budgets changed emphasis. Online budget formats were created that call for details of digital elements as well as engagement plans including social media, calls to action, etc., and follow up to make sure those elements are addressed. Changes in jobs and job descriptions to reflect digital priorities, including shifting more people to roles where their main focus is digital. Treasure Coast, for example, created digital producer positions to drive efforts on digital and social platforms. As well, journalists who embraced digital and social received recognition and plum assignments. “We treated social media interaction at the same level of importance and skill as producing a story or a photo,” Editor Mark Tomasik said. Staffing was aligned with digital needs. Changes were made in staffing hours to have more people posting at peak times in the mornings and on the weekends. Restructuring of editing desks. In Kitsap, one local editor became point person for digital/social during the day while a second local editor focuses on planning for digital. “They cross-train and share duties, but having each editor with an emphasis on their role has improved both,” Editor David Nelson said. In Redding, Editor Silas Lyons used an opening to realign his editing team of four. The managing editor and Lyons took on many of the metro editor functions, enabling Redding to hire a content editor with the expertise to drive digital and social practices into the newsroom. Moving the furniture. Treasure Coast moved the news meeting to an open area in the middle of the newsroom and invited staff to take part, an indicator of the new culture of participation. At the Caller-Times in Corpus Christi, “Our digital team is situated in the heart of our newsroom. This helps keep digital first strategies active on the newsroom floor,” said editor Tim Archuleta. The Memphis Commercial-Appeal had different newsroom departments spread out on different floors. Because of staff reductions, editor Louis Graham was able to move everyone to the main newsroom. The reorganization also placed the digital team adjacent to reporting team leaders. “The full room provides a sense of renewed energy and helps communication as well,” Graham said. “Editors are pitching in more the help one another. Communication is more effective simply because it’s easier.’’. This post originally appeared on the Community News Leadership 3.0 blog at Knight Digital Media Center at USC Annenberg. 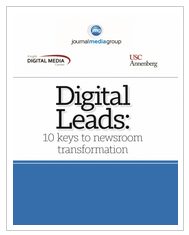 It is the second in a series based on a report I wrote, “Digital Leads: 10 keys to newsroom transformation” about work I have been doing with KDMC to speed the digital transformation of 13 Journal Media Group (formerly Scripps newspapers) newsrooms. The Four Platform N ewsroom initiative sought to keep journalism that served the local community at its center. A persona exercise (see previous post) was part of that effort. In addition to learning more about how different groups of digital consumers found their news, journalists learned through persona interviews how and why certain local topics were particularly important to actual news consumers. Knight Digital Media Center at USC/Annenberg introduced the concept of franchise topics to the newsrooms in 13 local markets over the course of 2013 as part of its work to help the news organizations (formerly Scripps, now Journal Media Group) speed their digital transformation. A franchise encompasses a highly local topic in which potential local digital subscribers have a high interest and are not satisfied with news and information that is available on the topic. A franchise topic also is an area where the newsroom has or could develop significant expertise that would enable the newsroom to own the topic in its market. Creating unique, local content that would drive readership and engagement was only part of the picture. A focus on selected topics would help newsroom teams drive digital production into the newsroom more effectively than attempting across-the-board newsroom adoption. That latter approach risked being shallow and short-lived beyond a few that had a natural affinity for digital work. Instead, developing significant pockets that would lead the way and model new practices for their colleagues offered a greater potential for lasting change. Also, by focusing first on highly resonant topics, teams were more likely to be able to experiment with engagement techniques and see a fast payoff in positive community response. But the primary reason for franchise was to heighten the news organization’s brand in the community at a time when web users did not value the old brand of delivering a comprehensive news bundle to local doorsteps every morning. Newsroom teams used consumer research and conducted their own interviews to shape their franchise topics and to determine what coverage and engagement made the most sense on each of the three digital platforms – web, mobile and tablet. They quickly found their topics were resonating. Treasure Coast Newspapers/tcpalm.com in Florida saw traffic peaks on franchise issues, visuals, and watchdog. “The digital subscriptions grew, in large part, because seasonal residents wanted to continue to read about this region on digital platforms when they moved back north for the summer,” editor Mark Tomasik said. Treasure Coast also saw communities mobilizing to take action, including protests and town hall meetings, and legislation passed based on issues the Our Indian River Lagoon franchise team reported on, Tomasik said. Treasure Coast sought to engage directly with residents and connect them with legislators. The news organization hosted four forums for subscribers about Our Indian River Lagoon in 2013 and 2014. At the 2013 forums, which were standing room only, opinion journalists interviewed state legislators and subscribers could ask questions either live or via Twitter. “It generated news. The legislators made promises that we then could track throughout the year. We videotaped it and made it available to subscribers. The legislators and the subscribers saw us as the leaders and facilitators and watchdogs on this issue. Subscribers thanked us repeatedly and profusely,” Tomasik said. The Wichita Falls Times Record News and TimesRecordNews.com developed a franchise topic called “Lifeline,” as the northern Texas town faced a water crisis. Coverage scrutinized water consumption by large entities – including the local Air Force base’s practice of using city drinking water to fill recreational pools and the police department’s washing of patrol cars in violation of city restrictions. An editorial criticizing the city for exempting car washes from restrictions prompted carwash operators to pull advertising. At the same time, the news organization published daily tips on how to save water. The effort brought significant results, including substantial reductions in local water consumption. The Redding (CA) Record Searchlight launched its solutions-oriented “Shaping Our Future” franchise exploring how the community is changing and how residents could help make it better last spring. Public engagement was immediate. Redding’s “Shaping Our Future” franchise was recognized in by Editor & Publisher as one of its “10 Newspapers That Do It Right” for 2015. The Kitsap (WA) Sun also paid close attention to social media on its “Kitsap Outdoors” franchise because it was targeting a younger audience. “We really watched the social media numbers. We saw the initial growth was really rapid. Outdoors ran past prep sports in terms of audience in three months. That was the crowd we were targeting. We knew they were on social. We saw it worked,” editor David Nelson said. Newsrooms also reported evidence that franchise coverage was driving subscriptions. For example, John Moore at the Ventura County (CA) Star said each of the three franchise pages – School Watch, Price of Paradise and Outdoors – last year ranked in the top 10 pages that people looked at and then clicked over to buy a subscription. “That tells us that we have been able to convert casual readers of franchise content to subscribers, which validates these topics. We also have strong time on site numbers for School Watch and Price of Paradise in particular,” Moore said. This post is adapted from “Digital Leads: 10 keys to transforming print newsrooms into digital news providers,’’ which I also wrote..
A major goal of an initiative to drive digital transformation in newsrooms was to help journalists understand and engage with digital news consumers. The newsrooms had deep knowledge of their local communities. But with their intense newspaper focus, they had not developed strong awareness of digital news consumption. To change that, we taught staff teams in each newsroom how to conduct, analyze and act on consumer research, including creating personas that reflected target audiences for journalism on digital platforms. Working with news organizations in 13 markets (previously part of E.W. Scripps, now part of the Journal Media Group), Knight Digital Media Center at USC Annenberg developed a process designed to facilitate newsroom transformation. The persona exercise sometimes engendered skepticism at the beginning. But it turned out to be one of the most impactful parts of the process. “The persona exercise had the most long term impact,” John Moore, editor at the Ventura County (CA) Star, said. “We, like others, had presented readership data before. But now staff members had to gather the data themselves, had to interpret the data themselves and – most importantly – had to attach that data to real people. It was that step of attaching the data to real people that helped them connect with the readers for their franchise. The company provided the staff teams with local consumer research that illuminated how different demographic groups – primarily defined by age, gender, income, family status and education – used different platforms to find their news. It underscored for the print-focused journalists that many potential readers under 55 were highly unlikely to seek news in print but were eager to find news about certain local topics on digital platforms. The research also confirmed that more and more people were accessing news on smart phones and tablets. It highlighted two key questions about topics: What topics were most people in specific demographic groups highly interested in? What was their satisfaction level with the information currently available? The answers enabled newsrooms to identify local news topics that fell in the sweet spot: High interest and low satisfaction. For example, the staff committee in Treasure Coast Newspapers and tcpalm.com in Florida targeted a female aged 35-54, with an interest in local politics, business and the outdoors. The second target was a man, age 55+ with an interest in the outdoors and who had adapted to digital devices. The committee at the Redding Record Searchlight and Redding.com in northern California targeted a man and a woman each aged 34-54 who were interested in local government and the economy. “Things to do,” either in the form of entertainment or outdoor recreation, was a topic of high interest in nearly every market. The Corpus Christi Caller-Times/Caller.com in Texas, targeted a woman 35-54 with children and a a man, aged 18-34, who were active on social media. How they framed the topic and why it was important to them. When they looked for news and information and what platforms or devices they used to access it. The interview material was used to create composites, or personas. While personas are fictional, they serve to make real the information needs and news consumption habits of potential users or subscribers. Though the concept was difficult for some newsroom leaders and staff members to grasp at first, it underscored the value of bringing consumer-first thinking to each newsroom team. Once they had created their personas, the teams designed coverage plans to meet the news needs of the personas. Mizell Stewart, the company executive who leads the Four Platform initiative said the persona process won over many skeptics. It “convinced a significant proportion of our journalists that they needed to go in that direction,” Stewart said. This post originally appeared on the Community News Leadership 3.0 blog at Knight Digital Media Center at USC Annenberg. It is the first in a series based on a report I wrote, “Digital Leads: 10 keys to newsroom transformation” about work I have been doing with KDMC to speed the digital transformation of 13 Journal Media Group (formerly Scripps newspapers) newsrooms. Little has proven more challenging for newspaper newsrooms than their transformation to digital news and information providers. It takes much more than learning new skills, although those are important. It’s a matter of re-engineering journalists’ attitudes and their relationships with news consumers, as well changing newsroom workflows and priorities. It takes significant culture change; both leaders and staff must shift how they approach their roles. All 10 factors are important. But ultimately, leadership that creates an open, adaptive culture and fosters staff buy-in of change is the linchpin of transformation. The effort was designed to support implementation of the company’s Four Platform Newsroom strategy, which was led by Mizell Stewart III, an experienced news executive with corporate roles at both Scripps and now Journal Media Group. The multiyear effort, which began in 2012, has achieved results. The newsrooms have either achieved or are close to achieving a “digital leads” footing in which they focus on journalism for phones, web and tablets and then produce a print newspaper at the end of the cycle. The transformation is not finished. However, as the title of the report indicates, we consistently saw 10 elements present in newsrooms that were quick to embrace the initiative and produce results. Strategy:The initiative was grounded in an overarching corporate strategy for multiplatform journalism that set a high standard but was flexible enough to evolve and to be adapted by each newsroom. Research:The company provided local consumer research to help newsrooms identify potential topics of high interest to target groups who wanted their news and information on digital platforms. Staff ownership: To foster staff ownership of changes, newsroom leaders appointed staff committees to determine key coverage priorities based on the research. Process and planning: Creating a consumer-focused newsroom culture was critical, so the KDMC process was designed to connect journalists with digital news consumers. Leadership and culture: Corporate and newsroom leaders kept up a steady flow of clear, consistent communication about the initiative, and facilitated staff ownership. Organization-wide buy-in:Newsroom leaders and committees made sure key people on the business side understood and supported changes in coverage. Training and tools:The initiative included KDMC and company training in digital strategy and literacy as well as skills training, relying heavily on free or low-cost training as well as peer learning. Organizational change: As newsrooms began to implement their digital initiatives, they altered their organizational structures, workflows, job roles and other internal practices to meet the new priorities. Priorities:Editors relentlessly looked for ways to cut traditional coverage to free resources for more compelling digital work. Feedback loops: Through web and social metrics or by re-connecting with key audiences, newsroom teams assessed what was working and what was not. The role that top newsroom editors played in the success of the initiative cannot be overstated. Without their willingness to step back and facilitate rather than acting as decision-makers, critical staff learning and buy-in would not have occurred. The more successful editors “made it very clear they were supportive of the process but had enough trust in their people to allow them to drive it. They were also savvy enough to choose the right people,“ he said. KDMC guided the committees through a process designed to help them better understand digital audiences and connect with their news needs. Stewart said the committees proved to be a key to getting the staff to embrace new ideas and practices. “The sense of ownership at the front lines really came from that,” he said. That did not mean top editors were divorced from the effort. Far from it. Guidance from the top editor contributed significantly to success of the committees. The more effective editors were active partners to the committees – communicating the strategy across the newsroom, providing support, time and other resources for the committees to do their work, and planning other changes as the initiative progressed. Leadership communication also played a significant role. Relentless repetition of goals and direction and a willingness to drop print activities signaled the importance of the digital initiative. In a handful of newsrooms, however, the process uncovered cultures of control and mistrust that had to be rebuilt under new leadership before significant work could go forward. The top editor or leadership circle tightly controlled activities and information. As a result, the staff members were afraid they might cross an invisible line or they did not know where they stood in terms of performance. This translated into a change-averse newsroom; change was just too risky for most of the staff. The top editor actively blamed someone else (often “corporate”) for the inability of the newsroom to move forward. This undermined the confidence of the staff that any changes or new efforts they proposed would be allowed to go forward. Happily, nearly all of the top editors in the Four Platform effort embraced the process and their committees produced effective coverage plans. Next: Connecting with digital news consumers. My new annual survey of online local news sites offers room for optimism: More than 60 percent of the publishers responding said they increased their revenues in 2013 over 2012. Still, it’s a hard slog: Only one third reported turning a profit and nearly half reported $50,000 or less in annual revenue. I conducted the survey via my database of local news start ups at www.micheleslist.org. Read more of my post at Knight Digital Media Center..
An earlier version of this site inexplicably disappeared from the Internet recently. The able folks at Techliminal rebuilt most of it, but not all the content could be restored. In addition to writing the News Leadership 3.0 blog for Knight Digital Media Center, I help develop training programs aimed at leaders of news organizations who are trying to make the transformation from print to multi-platform journalism. In past years, we’ve convened top editors and their online chiefs to spend four days at the center at the University of Southern California working with experts to develop strategies for transformation. Here is my report on KDMC’s 2008 conference. This year, we’re taking a different tack, and I’m the lead program developer so my sense of adventure and opportunity is in full swing! First, the program will focus on social media — why are new tools and practices valuable to established news organizations, how can they implement them and what will be the financial rewards? As I’ve noted over on the leadership blog, news organizations seem painfully slow to adapt these practices — either finding more readers on sites such as Facebook or adopting social practices on their own news Web sites. At the same time, adults of all ages are flocking to the networks. We want to help news leaders — editors as well as publishers — understand how social networks tap into a new audience dynamic and how these networks can help them reach larger audiences, measure those audiences and use those measurements to provide value for advertisers. Second, we’re going to conduct much of the training online and make it available to a larger audience — there will be at least three Webinars this spring in partnership with News University. A smaller group of participants will be selected to receive additional training and coaching online so they can develop a project for their news site. They’ll be invited to work with experts in Los Angeles next summer as they prepare to launch their social media projects. Here is the program announcement for News Leadership 2009. Third, we will invite the top editor and either the publisher or top revenue manager from up to 10 news organizations to be part of the more intensive training program that culminates in the summer conference. In the past, we’ve invited the top editor and the top online editor. Valuable as that has been, we believe that having the editorial side and the business side learn about new media practices and opportunities together will help assure success of their projects. If you have any suggestions for our program, please share them in the comments. And stay tuned for updates here and on the Knight Digital site..
“Mixed messages” from leaders hold back organizations. Adoption of clearer, more consistent message is one of the ways leaders can unleash tremendous potential that’s just waiting for clear direction. Improving communication can foster collaboration. Newsrooms need collaboration more than ever. The assembly line model of print production must give way to a more dynamic, multitasking organization.